What is a marketplace? While e-commerce world is a fast-growing phenomenon on its own, marketplaces and various B2C portals are more than ever in the heyday of their glory. Have you ever shopped at Ebay or Amazon? These are the world biggest online marketplaces. Speaking figuratively, marketplace is like an online shopping mall where anyone can sell anything to anyone and anywhere in the world. It is a cost effective solution where individuals and small businesses can sell their products easily and expand their reach while building their brand. This is a great way to jump start your online business and start increasing your revenue right away. How it works? Speaking about the technical side of the subject – marketplace unites users selling various types of products. From the first glance it looks like a conventional e-store, but the process behind the curtains is different. When a customer lands on a product they want to buy and clicks “Add to cart” (directly or searching via Google), the marketplace system places an order through the seller (vendor) who has that product and the seller subsequently completes the order by sending shipment to the customer. Payment is handled by the marketplace via payment gateways it’s integrated with. Sellers have their own accounts (paid or free, depends on the marketplace policy) where they manage all sorts of things like product listings, pricing, shipping policy, sales reports, feedbacks, etc. Depending on the marketplace, sellers are charged a percentage from their revenue with/or without a monthly subscription fee. What to sell at marketplace? People sell various stuff on the web: anything from a hairpin to a car or even a plane. Huge marketplaces as eBay or Amazon don’t limit their product categories to only real or virtual items (ie books, CDs) and allow selling all kinds of services like consulting, music composition, interior design and even computer repairing. There are service- or product-specific marketplaces: car rental and car/parts selling marketplaces (https://turo.com, www.justshareit.com), accommodation booking (www.airbnb.com, www.hostelworld.com), buy and sell arts marketplaces (www.artquid.com). Although they are planning to introduce wholesale businesses and manufacturers, originally Etsy.com was designed as a marketplace for arty people who create and sell their handmade products or have some rare vintage items for sale. Thus, there are three top product sections when you search through the website: Handmade, Vintage and Craft Suppliers (obviously, for those sellers who supply various things for handcrafters). They are further divided into categories and subcategories. Customers can shop for crafted articles as well as become sellers at the same time, so one account gives you both privileges – to spend money and to earn it. Etsy allows processing payment through PayPal as well as GoogleCheckout, Skrill (MoneyBookers) and even wire transfer, but this is configured individually by every merchant in their shop settings. If you shop in different stores – you will get separate orders and shipments as they do not consolidate into one. Usually, if shopping for several things from the same store, the vendor would provide a discounted shipping for another item in the basket. Etsy doesn’t have any memberships, however each item listing will cost $0.20/item (valid for 4 months or until the item is sold) and there is a 3.5% transaction fee of each item price. Another interesting feature Etsy has is store promotion. Since you do not have access to the server – you cannot fully manage search optimization with the methods you would usually use for other conventional websites. The basic thing though is filling up Title, Description, and Tags properly and most descriptively, including important key words matching the item you are selling. Another really powerful tool – joining one of the hundreds of Etsy communities that unite crafters selling similar stuff. You can share your new listings there and get discovered faster. In addition, you can connect your Etsy account to Facebook and Twitter and each new item will be shared to your friends at social networks. There are lots of useful tips on the web about promoting your store at Etsy, however Etsy itself provides a very easy built-in promotion tool, but not free of charge of course. They have their own Search Ads system that works similar to Google AdWords – you pay for a number of clicks and your item will appear in Etsy search results if a specified search keyword for your item was used in the search. 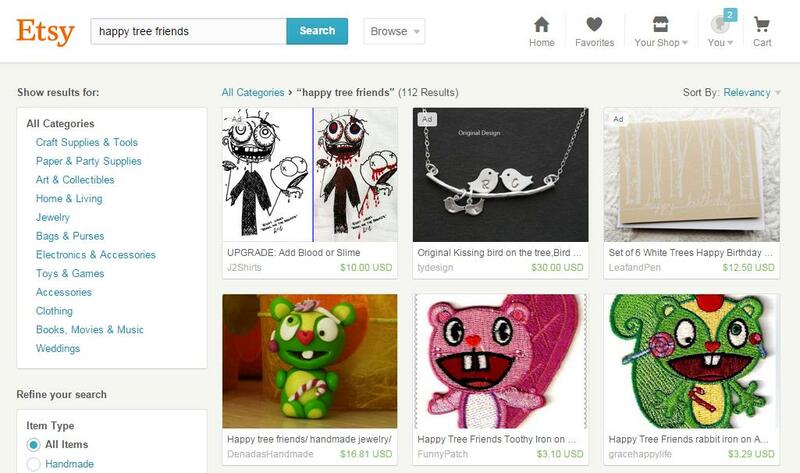 One more promotion feature Etsy has – built-in integration with popular search engines like GoogleShopping, Bing etc. There is no need to build any feed yourself, they do it all for you with just one click and $0 free (they however mention they might not be able to keep this feature free forever). That’s another super-popular website and many of you I bet have visited it at least once. On one hand it sells items by popular brands and works just like a normal webstore. On the other hand, if you ever noticed, there is a link in the top-left corner that takes you to a Marketplace section, where you have ability to shop for clothes from individuals as well as sell your own stuff, too. ASOS policy for sellers is straightforward and clear: Individual sellers (Wardrobes) get a free membership, can upload up to 100 listings and pay 5% off each sale. Big sellers (Boutiques) pay a $20 monthly fee, allowed unlimited listings, custom storefront, custom blog, custom account manager. Commission for each item sold is 20% though. Just like Etsy, Asos offers several options to promote your store with just a few of clicks. For up to £4 you can have your boutique/wardrobe appear in the top of category listing, on the homepage or other specified category of the Marketplace. The only payment option allowed at ASOS is PayPal. 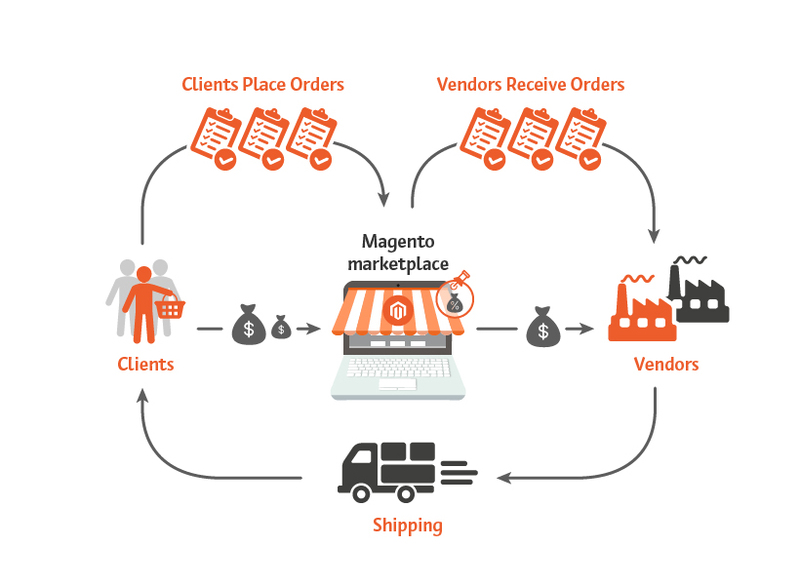 So – what does Magento have to offer? In fact, Magento doesn’t offer any ready-made easy-to-install with no-coding-required solution but there are a few extensions I would like to talk about that may facilitate your marketplace development. The marketplace extensions available out there may seem very similar to each other at the first glance, but our in-depth inspection and own experience have revealed some individual peculiarities. Some modules are fairly priced, some are madly expensive, but before you draw a decision to spend a fortune – take some time to carefully consider all pros and cons and learn about the advantages, as well as flaws and limitations. For $499 you will get a pretty decent yet modest marketplace extension that allows a user to create a vendor account in the front-end part of the store and have a vendor-specific URL with a dedicated store page, upload products to predefined categories, manage SKUs, view transactions, enable vacation mode. The module works with simple, virtual, downloadable and configurable products. Some of the other features Aaptha put on their website include social login, automatic product approval by store admin, shipping cost per product assigned by the vendor, sales reports, order management and commission calculation. However, if you want the commission to automatically split between the store and multi-vendors you will have to purchase an additional module – Aaptha PayPal Adaptive Payments, which is going to cost you $199 extra. It provides a chained, parallel or delayed chained payment via PayPal. In addition, you can also take advantage of the free add-ons provided together with the extension, including a OneStepCheckout module, but we can’t guarantee it will work nice and stable – the code delivered by Indian companies might not always meet the high standards of the industry. One more marketplace extension developed by yet another Indian company. Its features are pretty similar to the Aaptha’s: user registers in the front-end in a conventional manner with the option to become a seller right away or later. Vendors get their individual branded store pages with the collection of the products, transaction list, reports, reviews, etc. In addition, there is also affiliate functionality available. However, some essential things like automated commission payment, adaptive payments (splitting the payment between store admin and vendors), split shopping cart are missing and you will have to spend more money to purchase those add-ons. Also, there’s a chance you will spend more time and effort to fix a few bugs that appear here and there, especially with installing every extra add-on. Support is very responsive, indeed, and you will find many nice reviews for this company on Magento Commerce website, but the amount of bugs you are likely to find will require much more time and money investment than you might have originally planned. We have done several projects using this marketplace extension and experienced a few issues related to poor coding or inconsiderate logic. Yet another marketplace from Webkul studio, but this time it’s aimed for businesses cooperating with businesses: bulk orders, big quantities, big money. And big challenges, of course. We have already mentioned that the quality of code in these Webkul extensions will not impress you much, but let’s do some justice to this team: their extensions provide good solutions for many typical business needs, and maybe if you could put up with certain inconveniences – this might be just what you have been looking for. The idea of B2B marketplace is similar to that of B2C, but before any deal is closed (that is, the order is placed) there is some more interaction between the buyer and the seller. Suppose you want to buy 10,000 t-shirts. Even if you found a vendor to fulfill such a bulk order you probably will want to negotiate the quote and the timeline, while the seller will want to make sure they are capable of delivering such quantity in the specified timeframe. Webkul translated this business process into their B2B marketplace extension which has a separate login for retail and wholesale buyers, mass product upload using CSV file, conversation mode between store admin and both buyers/sellers, “request quote” feature for buyers and RMA return management. Marketplace admin can approve sellers/buyers, review/approve products, manage RMAs, set commission rate, view quotes and conversations. You might not find all the features required specifically for your business, but all in all it’s a good B2B marketplace extension to start with. This is one of the best and most powerful marketplace extensions in our opinion. Its developer worked hard to create a very cool product, that’s why he shows the demo to public only after you submit a request. Base package will cost you $1650 per license and various add-on features will add approximately $300 each. Among them are Vendor Payouts that allow generating vendor payment manually or automatically, bundled payout method with PayPal, custom payout methods. SplitRate add-on will make it possible to split products in the shopping cart by vendor and ship them individually per vendor product group. If you include all the features into your extension the price for a single domain installation will make approx $5000. The code is open-source but the license part is encrypted, and that shouldn’t hurt at all, hopefully. However, this extension is not very straight-forward for a store administrator. It has far too many settings in various parts of admin backend – sometimes it’s not very clear to understand where to configure what. Unirgy provide a one-hour video tutorial but frankly speaking it doesn’t help much. By default there is no registration form for sellers – quite an unexpected feature! On the other hand, there are a lot of settings to configure for a vendor, a very powerful tool for vendor-customer-admin communication. If you go with a MicroSite add-on – you will be able to provide your vendors an ability to link their domain with their microsite and install their own theme, however, shopping cart and checkout will still use marketplace standard design. In general vendor settings and features are extremely flexible here. The coding quality of this marketplace extension is very good and it’s very nice to customize it, but be prepared to spend a few days or more just learning how to configure various features and functionalities and learn to deal with them in the future, too. With no intention to overpraise it – this seems to be the best marketplace extension in terms of price, functionality and usability. Vendor is created as a user role in admin backend, and the backend is nicely styled not to scare people away with Magento standard backend theme. Vendors can manage orders, create shipments, ship products. Store admin is able to create flexible commission rules (per order, per transaction, etc), create vendor groups with group-wise commission rate, manage all the transactions, products, orders, invoices, etc. Extension allows to have a single order for many vendors (they will see only their products in the order) or split the order by vendor so that user will submit payment for each vendor separately. The sad thing is that you won’t get many features for $349. Just like with Webkul or Aaptha marketplaces – all the add-ons have to be purchased additionally and most of them are really vital for a successful marketplace platform. VnEcoms also offer a Platinum Edition for $999, but the extra features are not too impressive: vendor homepage (strangely, this feature is a stand-alone add-on at VnEcoms), banner manager, vendor reviews, vendor categories, UPS shipping, mass import/export products, and a few more. The more interesting and vital features have to be purchased even on top of the Platinum Edition: PayPal adaptive payments ($249), vendor reports, vendor attributes, vendor membership, search by vendor, etc. The full list of add-ons and pricing plans are available at http://www.vnecoms.com/magento-marketplace/pricing.html.